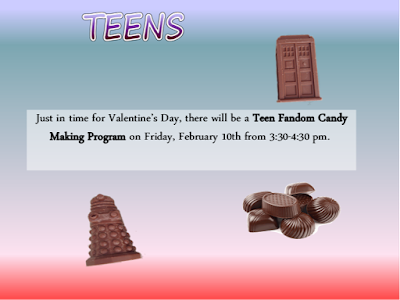 News at Spencer Public Library: Teen Fandom Candy Making Program! Teen Fandom Candy Making Program on Friday, February 10 from 3:30-4:30 pm. See how easy it is to make your own Valentine's Day treats for your friends (and yourself). We'll use melted chocolate and candy molds to create delicious treats. To make it even more exciting we'll have a variety of chocolate molds related to your favorite Fandoms. We'll also have supplies to make geeky Valentine's Day cards.